Lionsgate's Motion Picture Group President Joe Drake announced today that Academy Award winner T-Bone Burnett [Crazy Heart] and four time Academy Award nominated composer Danny Elfman [Edward Scissorhands] are collaborating on the soundtrack music for the studios adaptation of The Hunger Games, by Suzanne Collins. "Elfman and Burnett will be collaborating on the film score, with Burnett also serving as the film's Executive Music Producer, producing songs for the film and soundtrack" stated Lionsgate's Head of Film Music Tracy McKnight. "The Hunger Games' is such a special property – it has worldwide mass appeal, but it's also sophisticated, cerebral, soulful, and rebellious. We needed a composer who can translate these qualities musically, and we have not one but two incredible artists in an absolutely thrilling first time ever collaboration." 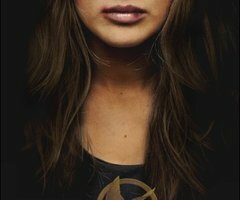 The Hunger Games hits theaters March 23rd 2012. I'm reading: DANNY ELFMAN & T-BONE BURNETT To Score Lionsgate's 'THE HUNGER GAMES'Tweet this!